The Aalto Vase (sometimes know as the Savoy Vase) was designed by Alvar Aalto, a world renowned architect and designer. Aalto vases come in a large selection of colors and sizes and its organic, flowing design is unique and outstanding. I love the fact that you can have a piece of classic design by a famous designer in our homes for just over $40 (starting price). Why settle for any old vase when we can have a real piece of designer glassware? Aalto originally designed this vase, as well as a number of customized furniture pieces for the opening of the Savoy Restaurant in 1937. It has survived design trends over the years and is still hugely popular to-day. This curvy little number is a timeless classic and it is made from hand blown glass. The vase can of course be used for the function that it was intended but it can also stand alone as a piece of artwork. 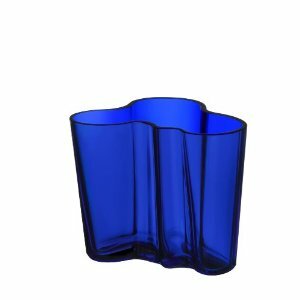 Why not use one of the fiery red Aalto vases or one in cobalt blue to add a splash of color to your room? They also make a great house warming gift – in fact I would be perfectly happy to receive one of these beauties as a gift for any occasion. Anyone?? 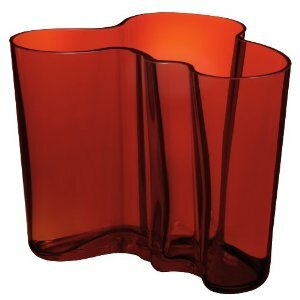 There are a large variety of Aalto vase’s available at Amazon and All Modern. Next articleA Contemporary Bookcase Can be Sooo Much More than a Bookcase!